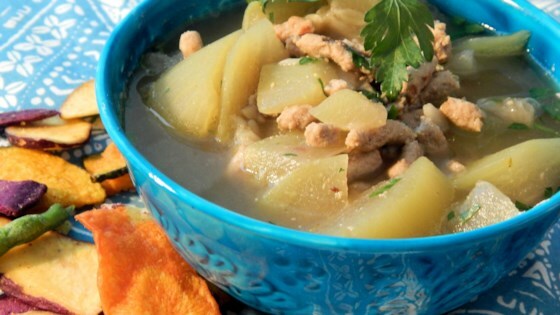 "We used to have a cucuzza (opo) squash tree when I was little, and I loved this soup. Yes, even as a little kid, this was good! If you can't find these squash, you can use more common ones like summer or zucchini. Serve immediately over warm cooked white rice." Heat oil in a wok or heavy pot over medium heat; gently cook and stir pork, breaking up meat as it cooks, until browned and crumbly, about 5 minutes. Add garlic; cook and stir until fragrant, about 30 seconds. Add squash and salt; cover wok and cook, stirring 2 to 3 times, over high heat for 2 to 3 minutes. Mix chicken broth, water, and chicken bouillon to squash mixture and bring to a boil; reduce heat to medium-low and simmer, stirring occasionally, until squash is tender and transparent in the soup, 18 to 20 minutes. Remove wok from heat and cool soup slightly. Skim surface to remove accumulated fat. Stir parsley into soup, return soup to a boil, and remove from heat. Substitute 1/2 teaspoon dried parsley for the fresh parsley, if desired.